Fantastic to see in your opening hand on the play. Drop a 2-cost character, then this, and get some free successes on a story. 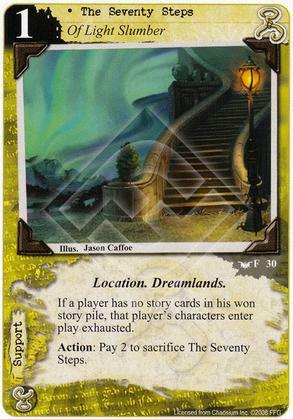 Very powerful in Hastur, often their lunatics don't mind entering play exhausted. Combine with Unending Festivities and some standing tech (Agency springs to mind) to really frustrate the opponent. Fantastic early game, useless late game. Ideally you need this in your opening hand and go first but you don't want to run multiples because it's unique and only useful on the first couple of turns. You have to rely on luck to get full use out of this card and rely on other cards to capitalize on the advantage, overall I'm not a fan.